Bare board 1 channel video encoder. Multiple, individually configurable H.264 and Motion JPEG streams; max. D1 resolution at 30/25 fps. Video motion detection. Active tampering alarm. Two-way audio and audio detection. Power over Ethernet (IEEE 802.3af) with power out for the analog camera. SD/SDHC memory card slot for local storage.. No power supply. 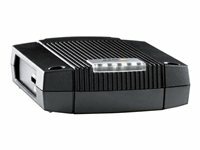 High performance, single channel solution AXIS Q7401 Video Encoder is a high performance, single channel solution that integrates an analog camera into an IP-based video surveillance system. With outstanding video processing capabilities, AXIS Q7401 delivers superb video quality and significant savings in bandwidth and storage. Reduced bandwidth and storage needs AXIS Q7401 offers the highly efficient H.264 video compression, which drastically reduces bandwidth and storage requirements without compromising image quality. Motion JPEG is also supported for increased flexibility. Full frame rate in all resolutions AXIS Q7401 can deliver multiple, individually configurable video streams simultaneously at full frame rate in all resolutions up to D1 (720 x 480 in NTSC, 720 x 576 in PAL). This means that several video streams can be configured with different compression formats, resolutions and frame rates for different needs. Wide range of analog PTZ cameras supported All Axis video encoders connect to analog pan/tilt/zoom (PTZ) cameras to allow for easy operation of these PTZ cameras across the IP network. Axis' open policy ensures simple and fast integration with most analog PTZ cameras on the market by including software drivers for more than 25 different analog cameras. Easy installation Support for Power over Ethernet (IEEE802.3af) enables the unit, as well as the analog camera that is connected to it, to receive power through the same cable as for data transmission. This makes for easy installation since no power outlet is needed. The one-channel video encoder with outstanding video processing capabilities is the perfect solution for analog installations migrating to IP. The video encoder is ideal for any application with high demands on frame rate, image quality and performance.The support for 60/50 fps provides smooth video in high motion scenes. This also enables the user to more closely follow details and changes in the monitored area, which is of great importance in forensic work. AXIS Q7411 can deliver multiple, individually configured video streams simultaneously, at full frame rate in all resolutions. The video encoder offers the highly efficient H.264 video compression format both in Base and Main profile, giving significant savings in bandwidth and storage. 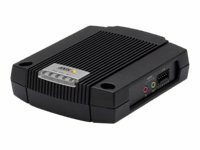 Motion JPEG is also supported for increased flexibility.AXIS Q7411 supports key IP surveillance features such as two-way audio, configurable I/O ports, edge storage with the built-in microSD/microSDHC memory card slot, and Power over Ethernet (IEEE 802.3af). 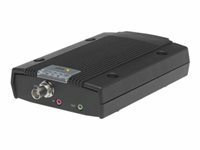 For significant installation savings, the video encoder allows PTZ control over the coaxial cable, in addition to standard support for PTZ cameras using the serial ports. AXIS Q7401 in 10-pack. Cannot be sold separately as single pack. Without power supplies. 1 channel video encoder. Multiple, individually configurable H.264 and Motion JPEG streams; max. D1 resolution at 30/25 fps. Video motion detection. Active tampering alarm. Two-way audio and audio detection. Power over Ethernet (IEEE 802.3af) with power out for the analog camera. SD/SDHC memory card slot for local storage. Includes power supply. AXIS Q7411 in 10-pack. Power supply not included. Cannot be sold separately as single packs.